Remember the Welcome Mass is on Sunday and your presence would be most appreciated in supporting our new families. Thinking about the season of Advent coming soon? No doubt you have seen the Advent Calendars for sale in the shops!! What about creating a Jesse Tree for your home!! Biblical persons associated with the gradual coming of the Messiah are represented on the Jesse Tree, named after the father of David. Read the Scripture and make your own tree at home, talking about these significant ancestors of Jesus as a family. Albert was born in 1206 in a castle on the Danube River in Swabia (southwest Germany) and was the son of a military nobleman. He studied at the University of Padua in Italy and there he decided to become a Dominican Priest. St. Albert loved to study. The natural sciences, especially physics, geography and biology, interested him. He also loved to study his Catholic Christianity and the Bible. He used to observe the ways of animals and write down what he saw, just as scientists do today. He wrote a great number of books on these subjects. He was a popular teacher in different schools. 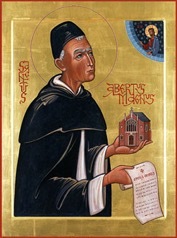 As St. Albert grew older, he became more holy. He died in 1280.